Feminine Boss Femme has several faces and nuances which highlight its personality and uniqueness. It was introduced in the third version, which has ingredients full of joy, light and nuances. 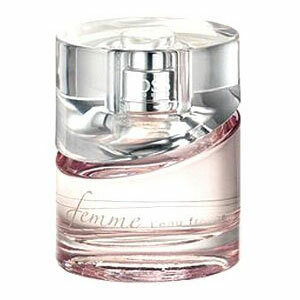 The new Boss Femme L`Eau Fraiche announces spring and romantic feelings, with simplicity and accentuated cleanliness. Enlightment of a moment, peace, tranquility and relaxation, light and easiness of movement characterize Boss woman, who wishes for gentle, light, refreshing and cheerful accords to accompany her style and temperament. Top notes shine with luminous accords of mandarin which is mixed with fresh, fruity notes. A heart introduces feminine Stephanotis flowers, whereas base notes incorporate creamy and soft amber. The bottle is the same as in the previous versions, Boss Femme from 2006 and Essence de Femme from 2007, in light pink nuances. Its package is also coloured in pink. The new fragrance Boss Femme L`Eau Fraiche will be available on the market from 2009.